UPDATE: Congratulations to Doug Saeltzer and Rich Schoenberger, of Walkup, Melodia, Kelly & Schoenberger, for winning 2011 San Francisco Trial Lawyers of the Year, as a result of this case! We learn and retain best when information is delivered in such a manner that we engage multiple senses in the process – the two most common and obvious in trial being hearing and sight. Arguing a case to the jury is standard practice in most cases and, when done properly, can help “turn on the light bulb” for those jurors who may need a little assistance in putting together the pieces of the case. Often, during the evidence phase of a trial, bits and fragments of information come in at seemingly unrelated points. Any effort to emphasize the connection at that point may draw an objection or, even worse, may offer clues to opposing counsel as to your trial strategy. More cases are tried using hard-copy exhibits without the use of technology than any other method – even today. While that may be true, it doesn’t mean that it is the most effective or efficient method available. Teaching a new subject to jurors and then leading them to view it from your perspective can be a difficult process and jurors can easily become bored or distracted. The easiest way to prevent this is to give them something to look at. While passing a document, diagram or photograph among jurors that they can “touch and feel” may seem like a good idea, you really have no control over what they actually read or see on the exhibit. Further, unless you wish to delay the trial while every juror has an opportunity to examine the exhibit, there may be only one or two who actually see what it is you want them to read/see, when you want them to read/see it. And yes, you can still enlarge or blow-up your exhibits, paste them on foam board and carry around a stack of exhibit boards with an easel, setting it up where half of the jury has to squint to read it and the judge can’t see it at all. If you do wish to use blow-ups for a key document or timeline, I would recommend limiting their use to only a few, and use at least 4’x6’ boards. One of the more frustrating things in trial is listening to counsel and a witness discussing the key points of a document, while no one can see it. This can cause jurors to feel excluded from the conversation – and essentially they are. While it is important during evidence presentations to make sure the jury can actually view the evidence, it is even more critical in closing argument. Presenting your exhibits on an ELMO is a good step in the right direction. A modern version of the overhead projector, the “ELMO,” (also document camera or visual presenter – ELMO is actually a brand-name) has been available for over 20 years. Used by itself as a means in which to get all of the jurors on the same page, it is a quantum leap beyond the dependency of the hard-copy exhibit, and can help the jury see much more of the evidence. The downside of using an ELMO is the fact that it is simply little more than a video camera, allowing the same type of area-zooming you can do with any other camera. It is effective, but cannot zoom directly in to a specific paragraph of a document, or perhaps a specific item in a photograph or map. While it is certainly not on the cutting edge of technology it is highly available, being found in most high-tech courtroom setups. When added to the complete system, the ELMO can function as an emergency method of presenting something that wasn’t included in the trial database. Since it is actually a camera, it can also be effective in examining a small exemplar exhibit. Presenting your evidence and making your closing argument from a trial database using TrialDirector™ or other trial presentation software will enable the most efficient and effective means of getting your message across. It is efficient because far more evidence may be displayed in much less time when compared to using only hard-copy exhibits. In other words, it keeps it you “moving along.” Post-trial surveys confirm that jurors, like judges, are truly appreciative of any effort made by counsel to speed things along. In addition to speed, trial presentation software is effective because counsel now has control over exactly what the jury sees and when they see it (all at the same time). It even provides an opportunity to argue the document to some degree by zooming into specific language and highlighting key text. Other effective features include the ability to zoom in on a photograph or Google Earth image, circle or place arrows at key points, and show what would otherwise be “hidden” to the viewer. In the latest version of TrialDirector, all of these features can even be performed on video as it plays for the jury. Regardless of what you are showing the jury, it is far more effective when displayed on 7 or 8 feet of screen. Regardless of which method you choose to present your closing argument, the best argument is a rehearsed argument. A prepared outline is essential, containing all of the key exhibits you wish to tie together, and in the proper order. Be prepared to use to your best advantage this final opportunity to connect with the jury as your visuals are presented, rather than shuffling papers and slides or fumbling with boards and generally appearing unorganized. The recent case of Emily Liou v. State of California, (Case No. CIV 460659. County of San Mateo) tried by Doug Saeltzer and Rich Schoenberger of Walkup, Melodia, Kelly & Schoenberger, illustrates the effectiveness of trial technology. 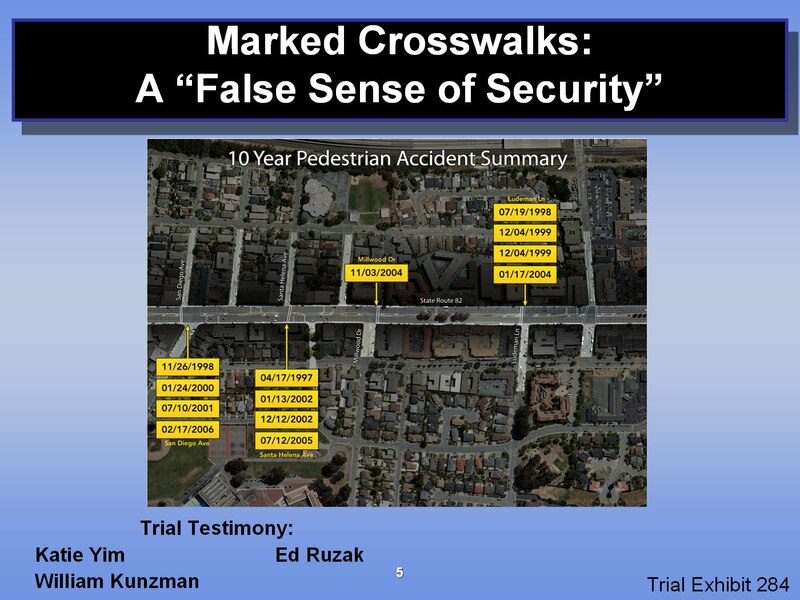 This case involved a 17 year-old girl who was struck within a marked crosswalk at an uncontrolled intersection (no traffic lights or stop signs) on El Camino Real (SR82) in Millbrae, California. 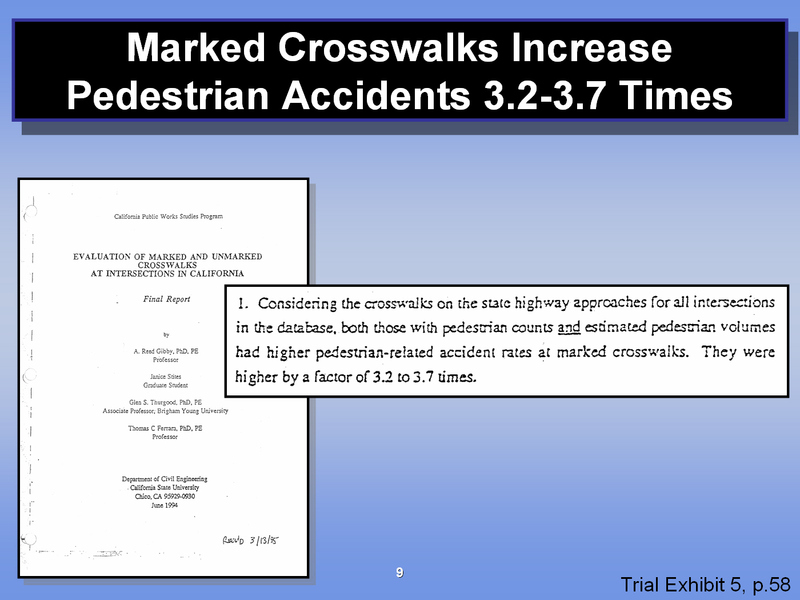 It was important to establish that Caltrans had knowledge that a marked crosswalk in an uncontrolled intersection (no traffic lights or other significant warnings to approaching motorists) was not only actually more dangerous than not having one at all, but also that pedestrians tend to have a false sense of security within a crosswalk. An effective exhibit helped to do this. The evidence also showed that there were four dangerous intersections on SR82, the worst being Ludeman Lane. What makes Ludeman Lane even worse than the others is the fact that the crosswalk is hidden behind a rise in the roadway when drivers are driving in the southbound direction. This was demonstrated by showing photographs of the roadway and zooming in to show how hilly it actually was. This little stretch of roadway had a very high rate of pedestrian accidents. 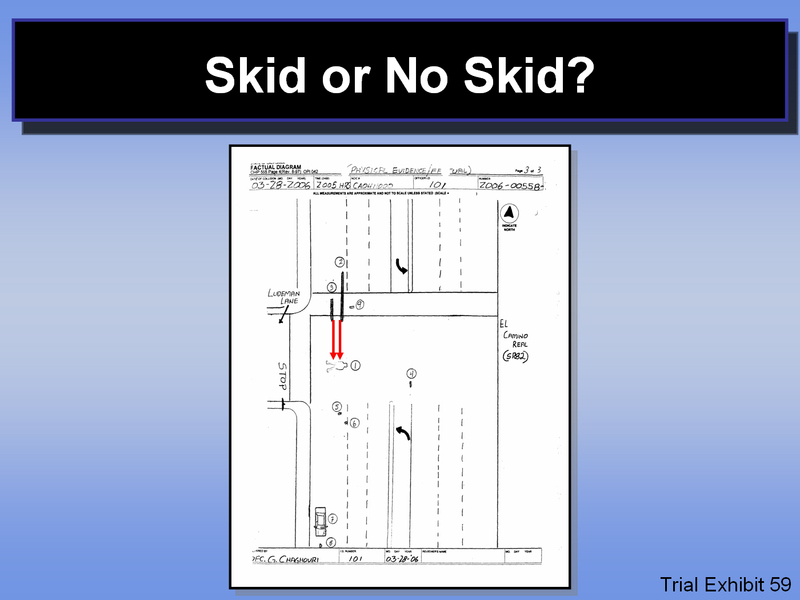 Simple demonstrative evidence helped to explain visually that although each intersection would stand out on its own as dangerous, when combined with the other nearby intersections it became extremely obvious that there was a major safety problem on SR82. 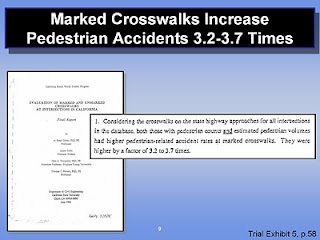 Several factors were shown to contribute to a dangerous condition existing on SR82 at Ludeman Lane: Not only was the road wide, busy and fast with visibility problems, but it also included a marked crosswalk at an uncontrolled intersection. A simple bullet-point slide was used in closing to demonstrate these points. 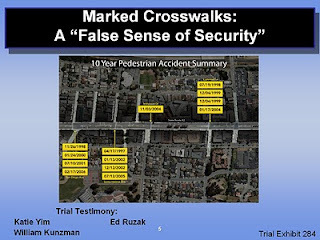 The defense theory ignored the fact that there were skid marks in the road at the accident scene, with one expert even going so far as to suggest that perhaps they were made just a couple of hours prior to the accident. Plaintiff’s experts successfully demonstrated that this accident had occurred exactly as described by police investigators. If the skid marks were indeed made by the co-defendant, Ms. Liou’s body would have been exactly where it was shown in the police report diagram. Simply adding a couple of arrows to the diagram helped emphasize this during closing. 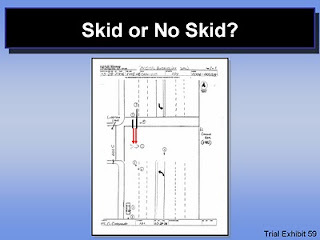 In each instance where a slide was created based on an actual trial exhibit, the exhibit number was clearly displayed on the slide for easy reference and juror note-taking. Could this case and closing argument have been presented without the use of technology during trial and closing? Possibly, but given the number of exhibits and photos that jurors needed to see and “connect” in order to reach their decision, it would have been more difficult and certainly would have delayed the jury’s $12.2 million verdict. Nice article-straight to the point. I would like to add that I feel you can't beat the ability to bring into deliberations the "old-school hard copy exhibits". I've heard many jurors say that really helped them come to their decision. Both can be used very effectively, trial presentation software in combination with blow-ups.This way if the jury request a hard-copy during deliberations you can give them a large exhibit that is easy to read and doesn't go away with the power off switch. What do you do with the waste or storage issue with foamcore boards? Foamcore is not a recyclable product and the courts are not willing to store the boards. what is your solution for that? Otherwise, a great article. Thanks. That's one of the great things about using trial technology - we reduce waste! Unless there is a good reason to have a large board printed, we will simply display it on screen. When there is something such as a timeline or other key reference graphic, we might have that printed, but generally there might be only one or two, if any. Often, the client will want to keep the blowups. The same goes for the trial exhibits – we work with digital copies of all exhibits, photos, transcripts, etc., so we actually go through very little paper for our part of the trial. Handling documents in this manner is a far more efficient method of presenting evidence, and using TrialDirector to zoom in and highlight on specific text gives us control of what the jury sees, and when they see it. Ethics: Whose Client Is It?